I'm a dog person, my husband's a dog person, the hot guy at your gym is a dog person, and the list of awesome "dog people" goes on. 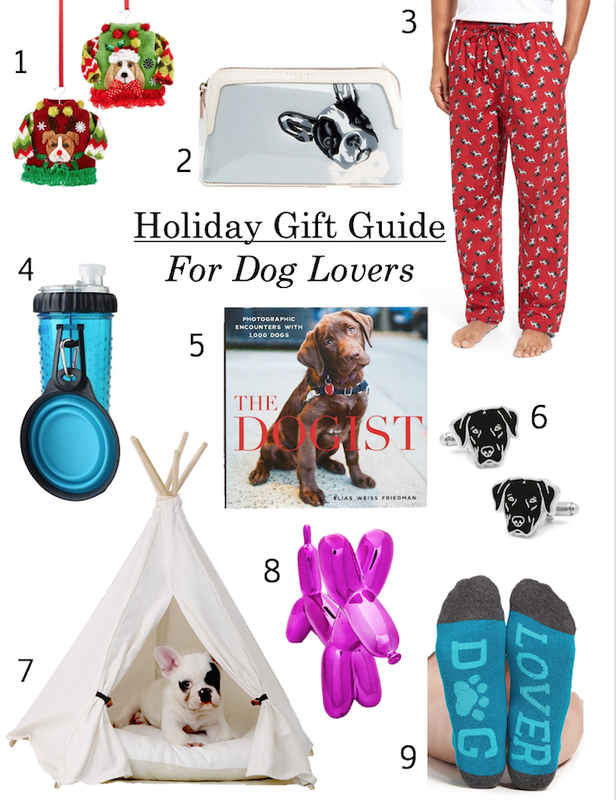 Every holiday season there is bound to be at least one dog lover on your gift list, so get to shopping for a gift that either represents their love of man's best friend or a gift for their own best friend (that's right, I'm talking about their dog). 1. Ugly Christmas Sweater Ornaments $8 - This set of "ugly Christmas sweater" ornaments features the faces of two holiday hounds, making it a gift for the decorating dog. I also love these more classic dog ornaments. 2. Ted Baker Dog Cosmetics Bag $48 - Gift a dog loving lady this sleek cosmetics bag featuring an artistic pooch pattern. 3. Dog Print Pajama Pants $42 - Pajamas are a classic holiday gift and a dog print pair is a great gift for guys and gals alike (shop women's dog print pajamas). 4. Snack Duo Bottle & Collapsible Cup $20 - For the active dog lover on your list give them a gift that they can use and that benefits not only them, but their hiking companion. This bottle has spots for both food and water and comes with a collapsible cup so you can feed Fido on the go. 5. The Dogist $25 - A coffee table book filled with photographs of cute canines is a great gift for dog fans your still getting close to - from your boss to your potential future in-laws. 6. Labrador Cuff Links $55 - Sleek and endearing black Labrador cuff links make a perfect gift for the dog dude on your list from your brother to your boyfriend. 7. Pet TeePee $90 - Gift your favorite friend and their pooch with a pet tee pee that is equal parts dog bed and hipster decor. 8. Balloon Doggy Money Bank $60 - This ceramic balloon dog shaped money bank is quirky and cute, making it a perfect gift for the dog lover that has a bit of Elle Woods in her. 9. Dog Lover Socks $9 - A pair of colorful ankle socks that spell out Dog Lover are a great gift for those who like to lounge with their furry companion.